A FORECAST (albeit incorrect) of light rain did not deter 24 Reading Roadrunners from making the journey to Wellesley Woodlands, Aldershot, for the second of five Hampshire League fixtures. This was a new venue last season, and we had enjoyed running here in February of this year. 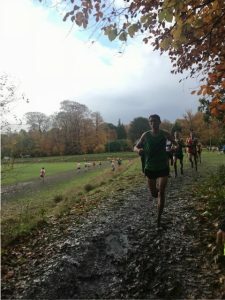 As is typical for Hampshire League races, the course for each race was to be made up of laps of different-sized loops. A potential disaster was averted when star performer Chantal Percival managed to overcome a bout of travel sickness in time to prepare for the women’s race. No thanks to Google Maps for its rather twisty traffic-avoiding route there! 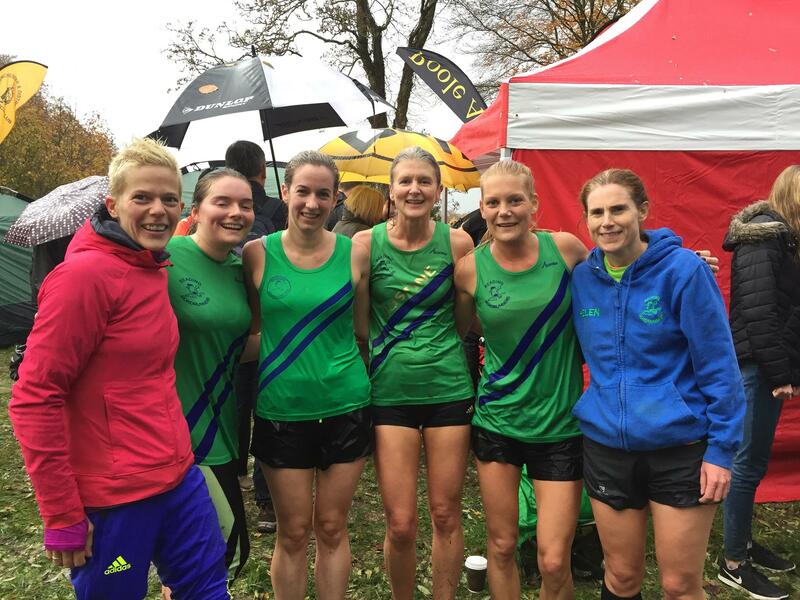 We were also delighted to welcome complete XC newbie Justine Morris to the team. “Are you fast?” we asked, as, while all abilities are welcome, it is sometimes nice to know in advance whether you will be required to score for the team. 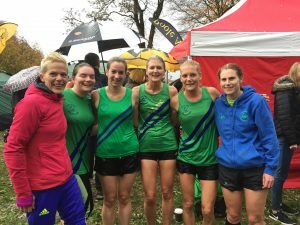 We were in luck; Justine’s 10k time placed her in the quick category, although how she stayed upright in road shoes, when most of the rest of us were wearing 12mm spikes, is nothing short of a miracle. As we made our way to the start line, with 10 minutes to go, our final reassurance came in the shape of Pip White and Bithja Jones, who were cutting it pretty fine, but a joy to see, nonetheless, as we were missing a poorly Sarah Dooley this time. Quick recovery, please, Sarah! With Aldershot hosting, it was no surprise that they were out in force, but Reading AC matched them, with 20 runners apiece. We did feel a bit surrounded on the start line, by the red, white and blue vests (the red, white and greens were too far forward to trouble us too much). Numbers generally were up this year, with 118 women last time we ran this course, and 214 this time. The course was a mixture of grass and woodland and, with some tight turns, this became quite congested in places. Aldershot’s Emily Hosker-Thornhill won the race, a whole minute ahead of the second-placed Louise Small, and with the Aldershot team taking the first four spots. As hoped, Chantal was the first RR home, in a fantastic position of 13th, even better than her 15th-placed finish in Bournemouth last month. Bithja was next, and our first vet, in 37th (9th vet), followed by Helen Pool in 70th (24th vet). A great start, giving a team position of ninth. Next in was Pip White, in 100th. We still needed another woman for our vet score, though, and this was to be Justine, in 103rd (39th vet), giving the vet team seventh place. Next to finish was Under 20 runner Katie Rennie, who this time had travelled by minibus with fellow Southampton Uni students, followed by me, just glad to get around with minimal discomfort after more than two months out with a glute injury, and the ever-reliable Claire Seymour. Cecilia Csemiczky completed the team. Above, some of our team face the camera. From left: Bithja Jones, Katie Rennie, Pip White, Justine Morris, Chantal Percival and Helen Pool. Nicky Spillane had brought her daughter for the Under 17 women’s race, but decided to spectate and support, deeming her foot to be not well enough to race. We returned from the women’s race to find that the tarpaulin had become a channel for a small river, and locating kit bags, coats and, as importantly, our food stashes, was a challenge. I would even say it was chaos, with everyone trying to change in and out of kit. With the men about to endure a 9.1k route, though, including passing the finish area three times, there was no rush for us women to leave the tent and brave the rain, with the driest viewing spots obviously going to be in the woods. The strength and depth of the Aldershot team was clearly in evidence here, with the first ten runners being theirs, all within two minutes of each other, and Bramley course record holder Jonny Hay winning the race. Our first man home, Jack Gregory (above), was 28th, followed by Mark Apsey in 31st. Chris Lucas was 46th, and then the first two of our vets, Lance Nortcliff (63rd, and sixth vet), and Andrew Smith (102nd, and 22nd vet). These results gave the team eighth place. Mark Worringham was missing from this fixture, due to family commitments, and a third vet was needed to complete the vets team. This was to be Ben Whalley, in 138th (37th vet), and sporting the retro vest that once belonged to Matt Richards’ dad. Be warned, if you ever forget your vest, this is the spare that I carry around, along with an RR technical T-shirt. The vets team finished in fifth place, but are joint first on aggregate. Great work! Next to finish was Pete Jewell, who had a cracking race, and, as usual, managed a big smile for his supporters. Then came Brian Kirsopp, followed by Stuart Jones, who I’m assuming enjoyed the Bournemouth fixture so much, he couldn’t help but return. Newcomers Liang Guo and Tim Grant were next to finish, followed by regulars David Fiddes and David Walkley, the latter christening some newly-purchased spikes. Completing the team were more newcomers in the shape of Alan Williamson and Matt Davies. I think it is fair to say that by the time 314 men had run their laps, the going underfoot was not in the least bit suitable for road shoes, which Matt, as a first-timer, had worn. Well done for getting around unscathed! There wasn’t much hanging around to be done after the men’s race either, with the focus on getting home and cleaned up (see picture above)! 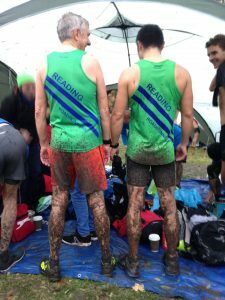 It is well worth investing in some decent grippy trail shoes, or, if you are planning to compete in Hampshire League or championship fixtures, some spikes, as most of their courses are grassy or woodland-based. 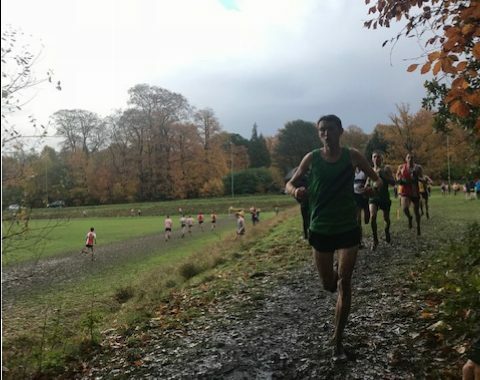 Not all of the TVXC courses are suitable for spikes, and we are advised of this before each fixture. 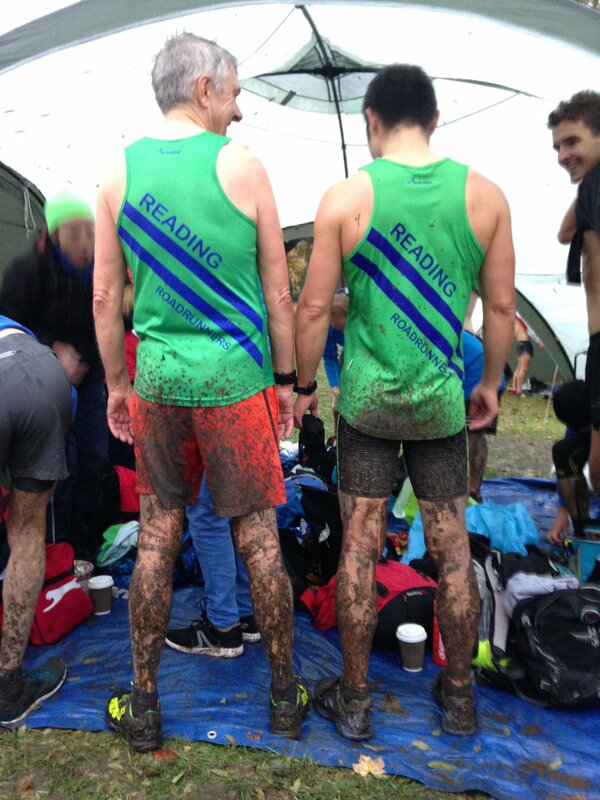 On that note, I was amazed to see Chantal, Cecilia, Stuart, Liang, Tim, Alan and Davids Fiddes and Walkley looking bright and breezy and ready to tackle the TVXC fixture at Eton the following morning. Had it been another rainy day, the prospect might not have been so appealing, but, as it happened, the sun was out, the air was still, and we only put up the event shelter to allow the cover to dry out, with the tarpaulin and tent sides hanging out to dry in my garden. 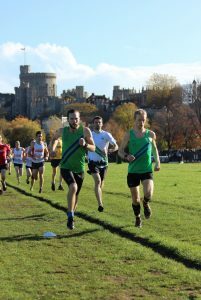 The TVXC results from Datchet’s fixture are now out, and with Rob Corney first male, and Chantal Percival first female, both our men’s and ladies’ teams finished second, but that was good enough to give us overall victory in the fixture . Above: Rob Corney and Dave McCoy lead the Datchet race from Bracknell’s Neil Kevern to the backdrop of Windsor Castle. Pictures: Phil Reay, Pete Jewell, Bithja Jones, Claire Woodhouse.